The Curious Wavefunction: How can we make the International Year of Chemistry successful? How can we make the International Year of Chemistry successful? 1. Explain to the public the essential nature and unique philosophy of chemistry: As a field, chemistry is inherently more challenging to pitch to the public compared to physics or biology. If you are a physicist and you say to a layman that you are investigating the Big Bang, you don't have to say anything more to get his or her attention. A biologist who works on human evolution will get similar nods. But what about chemists? One of the reasons for the relatively dim public appreciation of chemical science was mentioned before; it is because the field apparently lacks "big ideas" that people can instantly latch on to (but see below). 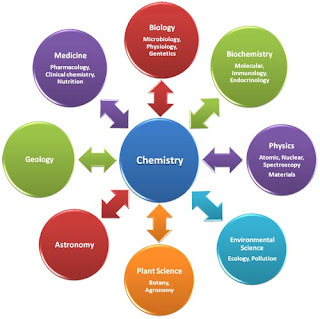 But what chemistry may lack in terms of the grand picture, it more than compensates for in terms of its identity as a "central science" and the sheer number of explanations and applications that it lends to almost every other discipline, from physics and biology to art and engineering. No other field does this in such a palpable way. In this sense chemistry is akin to engineering, but much more fundamental. The chemist more than any other kind of scientist is a discerning arbiter of patterns and a patterner of chaos. One of the most striking manifestations of this quality is in the beautiful structures that chemists draw and encounter every single day. Chemists look at structures the way artists look at mosaics of colors and architects look at geometric patterns of tiles. What other kind of scientist spends his or her professional workday doodling and evaluating lines, rings and their myriad intersections? In its ability for visualization and pattern analysis, chemistry comes closer to art than any other science, and the public needs to appreciate this supremely important aspect of the discipline. But it is in its ability to make new things which never existed before that chemistry is wholly unique. In the last few years synthesis and especially total synthesis have taken some flak as somewhat self-serving activities geared toward factory-style publication and the nurturing of slave labor, but it cannot be denied that synthesis is what makes chemistry different from all other disciplines. No other science can boast the creation of new substances that have improved every facet of human life, from the conquest of disease to the feeding of the poor. Of course chemistry also led to poison gas and nerve gas but this was true of other disciplines too. The fact remains that chemistry has modeled and sculpted the material world familiar to the layman more than any other science. Other fields provided valuable input to the principles behind synthesis, but the end products were those of chemistry alone, shining examples of the very ability of human beings to create, manipulate and improve. In the future chemistry promises us improved materials for alternative energy and designer drugs and biomolecules for treating disease. Convince the layman of the enduring centrality of synthesis, and you would have convinced him or her of the essential value of chemistry. 2. Push the origin of life as chemistry's "big idea": We mentioned above that chemistry seems to suffer from a lack of big ideas as compared to physics and biology and that this is partly responsible for its lackluster public perception. But as I indicated in my last post, there is actually a problem as big as any other which is primarily within the domain of chemistry. This is the origin of life within its broader framework of self-assembly. God must have been a molecular self-assembler, because without self-assembly the first components of life could not bond to each other and the first cells could not form and segregate their cargo, sparking the interactions and reactions that led to replication and metabolism. Darwin solved the second problem of what happens when life gets started, but not the first one of how it all began. Again, other sciences will continue to contribute to the unraveling of this problem, but the first step was uniquely chemical. A narrating of the origin of life as a quintessentially chemical question would also lead to a general exposition on self-assembly (important in diseases caused by protein misfolding) as well as a spirited homily on the central importance of weak interactions and hydrogen bonding. 3. Emphasize the crucial connections of chemistry with medicine and materials science again, and again and again...: It's official. The biggest practical contributions of chemistry to the betterment of human life have undoubtedly been in the discovery of new drugs and new materials. It is remarkable that every one of us benefits from these tangibles at every moment of day and night and yet fails to recognize the essential role that chemistry played in their creation. Since almost all of us know someone who has been afflicted or taken by a terrible malady, one would think that the public would be singing chemistry's praises for saving lives. Yet most people seem to think that it's doctors who discover new medicines. Quiz people about great medical advances and they would enthusiastically tell you about Alexander Fleming and Jonas Salk, but not about Gerhard Domagk or Gertrude Elion. This perception has got to change. Chemists are as responsible as doctors, if not more, for most of the live-saving drugs developed in the past century and will be responsible for many more in the coming one. The era of rational drug discovery was essentially ushered in by chemistry, and it will likely bring us novel advances in the form of designer proteins and small molecules as selective drugs against new threats. The public needs to know this crucial function of chemistry, and it can only be accomplished by drilling the facts into the public's mind eloquently and ad nauseam. The other field where chemistry promises world-changing discoveries is in materials science and nanotechnology, especially as applied to energy. With climate change looming on the horizon, the next generation of breakthrough solar cells or other technologies may change the lives of millions, dramatically reduce our carbon footprint and impact the international geopolitical landscape. A central player in this seismic shift will undoubtedly be chemistry. The public now thinks very highly of nanotechnology but very few people realize that chemists have been practicing nanotechnology since their discipline gradually emerged from the shadows of alchemy. Polymers have revolutionized our lives as much as anything else. In the future polymers will contribute in novel ways such as drug delivery vehicles and smart materials in electronics engineering and space science. Organic electronics is another lucrative area of polymer science which will pay huge dividends in improving communications technology, leading to improvements in everything from healthcare to education. As the world inches closer to potentially devastating climate change and its global and social repercussions, chemistry will undoubtedly play its important role in saving the planet. By bridging all other disciplines, enabling human progress and knitting the tapestry of the material universe, chemistry encircles the world. This is our chance to let everyone know. Hey there, this is a really great article. I was just detailing not even a few weeks ago how chemistry is a central science, using almost the exact same diagram that you have up there. Well done! Profound. I really enjoyed this and learned something from it. Thanks. Nice post. I have the same opinion about "chemistry's big idea". I think that everything that, in science, is related to detective work attracts a lot of people. One thing that, in my opinion, should be worked on in this International Year of Chemistry is the myth that chemistry is only related with poisoning, pesticides, herbicides and all those "artificial" and bad things. This post touches on a lot of things that I find to be really important. I am in almost complete agreement with many of your prescriptions. And, you are much more eloquent than I am in getting these ideas across. The one question I have for you, which is something that I've been thinking about a lot lately, is how do we effectively communicate chemistry. I agree that materials seems to be the best place to go. But it still seems like there is a huge activation energy to get over. I think that it's going to be a lot more difficult than what you have laid out here. Thanks for the comments. Effectively communicating chemistry is indeed a challenge. Do you mean effectively communicating actual chemical concepts in the classroom or effectively communicating the importance of chemistry in a public forum? The two situations naturally require different if somewhat overlapping skill sets. But in both cases it seems to be clear that reiterating the practical importance of chemistry will continue to be part of the way forward. I constantly try to use my classroom as a platform to explain how chemistry affects or is involved in everything. We are currently evaluating how to use our website to promote chemistry as a whole. I think younger students are turned off by some of the challenges of understanding the subject and just want to get through it. We are hoping to find a way to make it easier for them so they can enjoy it.